Help potential customers realize what you can do for them, via editorial coverage of your company and its products and services in the publications they read and websites they visit. When it comes to marketing for business-to-business sales leads, the most relevant public relations (PR) activities are those that create qualified leads. Your public relations goal should be to help potential customers realize what you can do for them via editorial coverage of your company and its products and services in the publications they read. The public relations discipline covers a vast array of activities—everything from ribbon-cutting ceremonies to crisis communication. 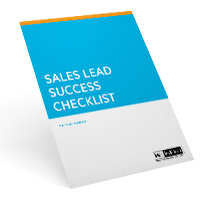 Some of these activities are geared toward creating qualified sales leads and can play an important role in your marketing-for-leads program. The most common lead-generating PR technique for business-to-business companies is editorial outreach. The objective is to get a mention of your company, products, services and/or managers in articles published by the magazines and newspapers your prospects read, or to get an article written by a manager from your company published in a target publication. These kinds of editorial placements can have a significant impact on lead generation. Whether you hire a PR agency or do your own PR, you should take the following steps in crafting your program. Create a list of target publications, and get to know them. When creating your publication list, keep in mind who reads the publication—is it your target audience? If not, the publication might not be the best one to target for PR. Also consider the type of information the periodical publishes. If it’s an industry trade magazine specializing in product news (all you see are photos of and blurbs about products), the editors probably don’t want your press release announcing the appointment of a new CFO. Talk to the editors. Before contacting any editor, review the publication or Website. Then determine which editor is the correct one to contact. Call that editor and ask about his/her needs and preferences. An editorial calendar that lists the topics being covered each month can usually be found in the advertising section on the publication’s Website. After reviewing the calendar, you can decide which stories you can offer to be a source or expert for, or which months you could offer a written expert-opinion piece. If you are persistent, eventually you will speak with an editor on the phone or in person. It’s a good idea to mention trends, research and technological developments pertinent to the publication or the editor’s beat. This is the kind of information editors remember when they receive assignments. If you have a story idea you want to pitch, call your editorial contact. Explain how the story relates to the editorial calendar. Be prepared to send in a synopsis and story outline ASAP. If the editor asks you to submit the entire article, be sure to meet or beat the deadline, recognizing that the editorial deadline is usually different from the advertising deadline. It often pays to have your articles ghostwritten by a professional writer. Professional writers know how to work with publications and can craft your article so that it doesn’t come off as being overly promotional. Hiring an outside writer also ensures that your article is completed in a timely manner—writing an article is time-consuming and can be difficult for busy technical people or managers. When writing or reviewing a press release, make sure it’s actually announcing news. Editors are looking for information their readers want to know, usually about a service or product that solves a business problem, reflects a new way of doing something or saves money. When talking about your news, you need to address it from a reader’s point of view: how it will benefit the reader? What business problem is as yet unsolved? What is the product or service, and how does it solve the problem? Why should a reader care about this product? In addition, the release should avoid corporate self-praise. Eliminate words like “revolutionary,” “unique” or “best.” Editors like to see quotes—or testimonials—from your customers, rather than praise about the product from someone within your company. Also, avoid using jargon. Have someone who doesn’t know anything about the product read the release. Can he or she understand it? Remember, editors do not have your depth of knowledge about your product or service. Write simply and clearly. Your release must also include contact information. Clearly indicate your company’s contact names and titles, phone numbers, fax numbers and email addresses, at either the top or the bottom of the press release. Offer photography to publications that use it, and ask the editor about preferred formats. Today most publications prefer digital photos. Be sure to give the digital photo files descriptive file names so that editors can easily identify them. Submitting press releases via a wire service is a great way to improve your search engine optimization efforts. Once it is sent out, your release is picked up by search engine news services (e.g., Google news), news organizations and publications—all of which link back to your site. These links are very important for SEO: the more links you have pointing back to your site, the better your “ranking” and the closer to the top of the list your company appears in search engine results for specific keywords. Submitting your release to a wire service also helps ensure that journalists can find information about your company or product. According to a Middleburg/Ross survey, 98 percent of journalists go online daily—with 73 percent of them looking for press releases. A bonus tip: Google Alerts are a free and easy way to be notified of any news about your industry, products, services or competitors. Go to www.google.com/alerts to learn how you can subscribe at no cost.